Aquantia Corp., provider of high-speed Ethernet connectivity solutions, has partnered with AptoVision to produce a fully integrated, single-chip solution for implementing software-defined video over Ethernet on 10G BaseT infrastructure. The combination of Aquantia’s AQcite FPGA-programmable, multi-gigabit Ethernet PHY with AptoVision’s BlueRiver technology provides a power-, size-, and cost-efficient implementation of the new SDVoE standard. The new solution is on display at ISE in the SDVoE Alliance stand 12-H55. 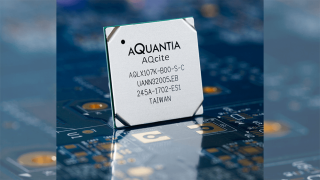 Aquantia recently launched its AQcite product line, and specifically the AQLX107, a FPGA-programmable multi-gigabit Ethernet PHY device targeting a vast range of applications such as AV over Ethernet, machine vision, data center, enterprise, 5G wireless, industrial, metro environments, and more. AQLX107 integrates a programmable FPGA processing fabric with a 10G BaseT PHY, to create a single-chip hardware platform. Combined with AptoVision’s BlueRiver technology, the AQLX107 can be used to transmit 4K60 video across off-the-shelf 10G Ethernet networks and standard category cable with zero frame latency. Audio and video processing, including upscaling, downscaling, and multi-image compositing are all realizable on the SDVoE hardware and software platform made possible by the AQLX107. This feature set enables applications across the complete spectrum of AV signal management. The solution offers uncompressed 4K streaming over standard Ethernet switches and unique support for HDMI 2.0a and HDR content. The AQLX107 is a full-stack solution, from the physical infrastructure to the SDVoE API. It is IEEE 802.3an/bz and NBASE-T compliant, featuring AQrate Adaptive Rate Operation, with robust radio frequency interference (RFI) performance designed for resilient operation when exposed to RFI/EMI. A comprehensive API provides a simple interface to control complex tasks like video routing, scaling, aspect ratio management, video wall processing, image compositing, audio downmixing, and more. It enables end-to-end transport latency under 100 microseconds (under 1/150th of a video frame); fully uncompressed transmission for all HD and 4K30 signals; artifact-free transmission of 4K60 (4:4:4), indistinguishable from original source; and multichannel audio transmission and independent audio routing. Aquantia’s AQLX107 is currently sampling. Production release is scheduled for April 2017.